This post is a continuation of the "Duo goes" series by StrapsOption. After visiting South Africa, Duo decided to go to Scotland after finding out Scotland had an Independece Referendum back in September. Edinburgh Castle is a historic fortress built around the Bronze Age. The castle dominates the skyline of Edinburgh today. Loch Ness is a large, deep, freshwater loch located in the Scottish Highlands extending for approximately 23 miles southwest of Iverness. Loch Ness is known for alleged sightings of the Loch Ness Monster aka Nessie. The Highlands are sparsely populated and is culturally distinguishable from the Lowlands. The Highlands contains many mountain ranges which dominate the region and has the highest mountain in the British Isles, Ben Nevis. Glasgow is the largest city in Scotland and has a population density of 8,790 per square mile, the highest of any Scottish city. Glasgow grew from a small rural settlement on the River Clyde to one of the largest seaports in Britain. Despite its northerly latitude, Glasgow's climate is classified as oceanic. Recently, Glasgow hosted the 2014 Commonwealth Games. The Shetland Islands is a subarctic archipelago of Scotland that lies northeast of the island of Great Britain. The Islands lie about 80 km northeast of Orkney and about 280 km southeast of the Faroe Islands. Shetland has a population of 23,167 and its total area is 1,468 square km. After visiting the Shetland Islands, Duo was tired and wanted to go home. Upon arriving Pittsburgh, Duo created a Scottish Gaelic course. After months of waiting, the Scottish Gaelic course graduated to beta in the incubator. 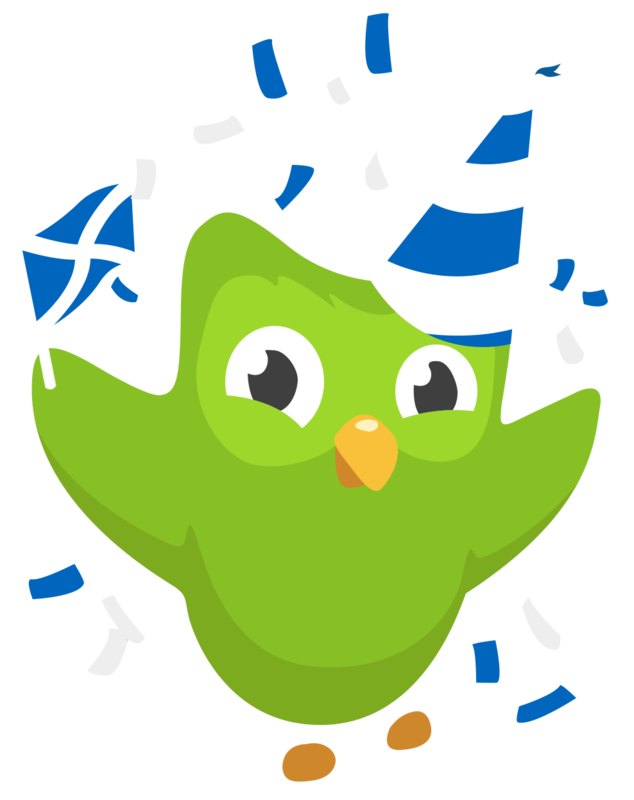 Duolingo, please add Scottish Gaelic soon! Duo in Loch Ness looks so saaaaad. Is he cold? Hi, Rebecca. Fun fact: "R-1" is what it says on the bus in the intro of South Park. I used to live in apartment R-1 at my old apartment complex so I noticed it and your username reminded me of it, lulz. 100% would attempt to complete a Scottish Gaelic tree. Awesome post, hope Scottish Gaelic is added! Scotland looks like a nice country to visit and it would be great to have basic conversation with people! Unless you're planning on visiting the west coast you'd probably do better learning Scots if you want to speak to people. YESSS!!!! Scottish Gaelic is my ultimate goal! Scottish Gaelic would be amazing! If they add it, I would work on it as hard if not harder than I have been working on German. When I first learned about Duolingo, I wanted to learn Scottish, and I was disappointed that they didn't have it. So I had to settle for German, which is great because I am at least a quarter German. But I really hope they add Scottish Gaelic. I am trying to find support for getting a Scottish Gaelic course on Duolingo. If you are interested, visit this page. Scotland forever! A minor issue, but have you thought about what flag you'll use for Gaelic? There's two Scottish flags you know. One is St Andrews cross, the flag of the country of Scotland. And some people in the Scottish diaspora fly the Lion Rampart, a red lion standing on it's hind legs facing left, on a gold field. Beautiful! I saw early that you were making this, and have been sitting anxiously for the past 15 minutes, just waiting! Love this! I have decided to destroy you with the most formidable weapon in Duolingo history-a LINGOT BOMB!!! Best part of Scotland: Doune Castle where Monty Python and the Holy Grail was filmed. My family went to this castle purely for this reason. Yes, I'd like Scottish Gaelic too. Thanks for the Scottish Duo, I have put him as my little picture! Hey, you sure that's Trio? I'm pretty sure Duo was talking to his cousin and best friend, jackelliot! Of course ^_^ Who wouldn't? I'll put it on the directory as soon as possible. One needs to have a few drams to see Nessie! I can't imagine owls drink much whisky. Well, I ended up moving to Scotland to study Gaelic, that's how much I liked it :D Wow, so much has happened in these 8 months. Yes, this would be fantastic! Please, please, please, please add Scottish Gaelic! I would give all my lingots to Scottish Gaelic! (Which I did). I'm Scottish and you did a good job, but you missed out Melrose Abbey in the borders where Robert The Bruce's heart is. This is an awesome post. I am half Scottish myself, and been to most of these places. It would be really cool to learn Scottish Gaelic before the next time I go back. When someone says they are half Scots/Welsh/English (whatever) a silly though comes into my head. Which half? Sorry, just being daft. Have a lingot. Lol, thanks. My dad lived in Scotland and came to the United States on a business trip, where he met my mom. I love these kinds of posts! :) Thank you! haha in a very proper accent. Oh awesome!!! And, I think I really like Duo's cousin.. :) I love these posts! Has Duo visited Wales yet? Do Wales! I like Scotland nad both Scottish languages are welcome. You can't learn Scottish Gaelic on Duolingo yet. I would love Scottish Gaelic! I want to learn Irish, but I'm a quarter Scottish and my home town (and university) were both founded by Scots, so this would be my Celtic language of preference. And I love Scotch. Mmmmm. Scotch. Fast-track this please, Duolingo team! For what it's worth, Gaeilge and Gaidhilg are very similar languages, to the point of some mutual intelligibility. The hardest parts of each for an English speaker are probably the same, so it might be worth starting with Irish to get acquainted with how Gaelic languages work and then shift over to Scottish Gaelic from there. Yes, I waved to Duo when he flew over my house just west of Edinburgh. Very best of luck to everybody with learning Scots Gaelic but please note it is only spoken by a very few people in the western islands and Shetland, unfortunately. If you are interested there is a dialect called Doric (Google) which is spoken where I used to live near Aberdeen which I suspect may be spoken more widely than Gaelic (but I could be wrong). ah, happy to be away from the dreichness of Aberdeen? My dad works at RGU 2 days a week and that's bad enough for him. Heh, heh! My compliments to him! Great post! I wish Scottish Gaelic were more prominent in Scotland; it is mostly spoken in the remote northwestern reaches of Scotland - and even there, English is displacing it. I love the logic with Duo-Trio, that's the same logic I'd used for my name! Please add Scottish Gaelic to your courses!!! Yes, please! for Scottish Gaelic!!! I would sign up in an instant, and do everything in power to complete the tree. Please add Scots English. Gaelic is oot o' ma division.